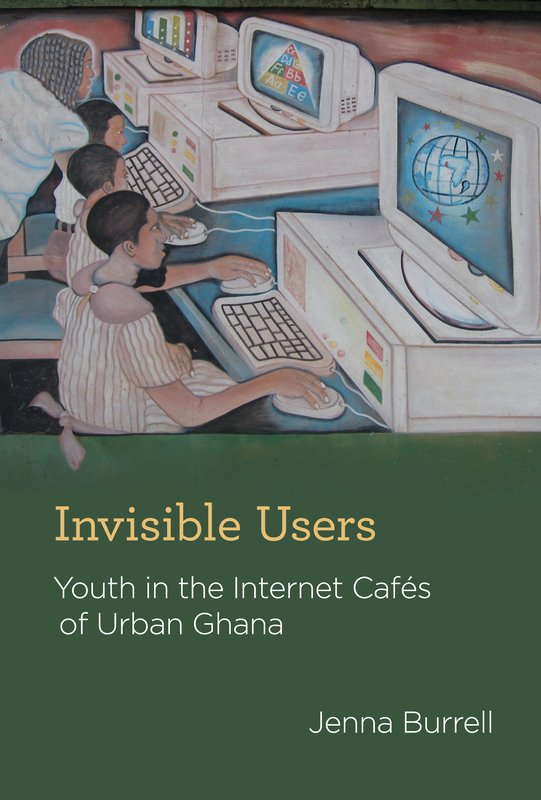 Invisible Users: Youth in the Internet Cafés of Urban Ghana. J. Burrell. MIT Press. June 2012. There is surely an irony in receiving an email from someone at my own institution, but who I have never met, asking if I would review a book for a blog, a synopsis of which will then be Tweeted to ‘followers’, when the book itself is an account of peoples’ uses of the Internet. The irony only deepens when writing the review I become the self-inflicted victim of ‘digital distraction’; namely, the ease by which it is possible to put aside difficult tasks in preference for trawling the Web. Digital distraction was recently highlighted by the novelist Sadie Smith who claimed that she was only able to concentrate to finish her most recent book, NW, thanks to software that limited her ability to browse the Internet. Commenting on Smith’s predicament, the author Will Self revealed that he keeps his PC in a separate part of the house from where he writes, for which he uses a typewriter. Such misgivings about the Internet might seem indulgent and trivial to the people who are at the centre of Invisible Users. Jenna Burrell’s careful ethnography explores how the Internet promises young people in the cafés of Accra a route to change the humdrum daily fight for livelihood, challenge claustrophobic cultural norms, construct cosmopolitan identities or get out of Ghana altogether. Yet, for most young people Internet connectivity has brought new frustrations and few material benefits; the chances of landing a ‘big fish’ in the jargon of online dating proves illusory for most and costs both time and money through the high café fees. In many cases, the analysis might end there or it might be followed with a list of policy ideas to better ‘connect’ Sub-Saharan Africa, to get more PCs to the region or to train people in the productive opportunities hidden in the furthest reaches of the Web. As Burrell points out, when justifying the title to her book, the young people huddled around second- or third-hand PCs in Accra’s cafés are marginal to an Internet mainstream, and as such might be considered invisible. But, they are also invisible in other ways and this online invisibility can be a form of power that allows multiple transgressive behaviours to be undertaken. The café serves as an “unclaimed space” where youth enjoy “watching and emulating music videos, flirting with foreign pen pals online, trying to hack computers to get free browsing time, playing online games, or finding ways to obtain free things such as pamphlets, bibles, or CDs of computer games” (p43). Perhaps most artfully captured by the actions of scammers – the 419s or sakawa – pretending to be corrupt finance ministers’ relatives or orphaned children, the internet brings older presentations of an ‘other’ through so-called ‘new media’ into the intimate daily lives of strangers across the globe. Rather than pin down these processes as examples of a network society or globalisation from below, Burrell draws from Danny Miller’s writing on material culture to argue that it is misleading to think of technology as a single, seamless, network. Rather, we need to understand how people in different circumstances interface with the technology and how this possibility affects their lives. This endeavour is skilfully brought out over a series of engagingly written chapters. I could relate immediately with the examination of cafés in ‘slum’ neighbourhoods such as Mamobi, where I have worked, and the idea that these spaces “provided a canvas for imaginatively exploring cosmopolitan yearnings” (p.48). Burrell extends the narrative to show how the technology in the room is intimately, corporeally, related to young peoples’ attempts to construct identities as they hang out at the ‘bases’, the meeting points for young men on street corners, located across the area. Invisible Users explores other ways young Ghanaians use the Internet to forge intimate cross-cultural encounters, through connections with multiple pen-pals for instance and the 419s. These encounters rely on participants generating digital versions of themselves as authentic and persuasive, involving for some acts of gender and ‘race’ swapping, and a ‘false familiarity’ persona that masks more solicitous intentions. Instead of building genuine understanding, however, these tactics rely on and reinforce representations of ‘Africa’ that participants ultimately resent when these are turned back on them. Thus, after hours of chatting with pen pals in dating sites – an exchange that relies on Ghanaian representations of Western men as sad, desperate and rich, and on Westerners’ perceptions of ‘Africans’ as passive and sexualised – the arrangement is abruptly ended once less romantic motives are revealed. Such ‘digital shunning’ extends, it is later revealed, to on-line mail order and travel agencies that ban e-traffic originating in West Africa. Digital exclusion is both felt by young Ghanaians but it is also partly produced by them. Nevertheless, as the interesting companion chapter on rumour demonstrates, the frustrations and knock-backs are reconstituted as accounts of almost getting there, reinforced by stories of those who had ‘made it’, and blurring direct experience with dramatic ambiguous appraisals of success and failure. Continuing with the idea of how the Internet is materialised, Burrell argues that it is useful to go to church, the dump and get close to development ‘thinking’. In a fascinating portrait, the ‘virtual’ sphere of the Internet is shown to accommodate the metaphysical, especially through the prosperity gospel of evangelical Christianity, but religious assistance was also called upon by Ghanaians wanting to gain an ‘edge’ to their online schemes. Rather than serve as a secularising force, or at the very least a technology prone to the irreverent, the Internet appears as highly compatible with the religious. Similarly, in the exploration of The World Summit on the Information Society held in Accra, the countercultural image of the Internet is cast in doubt. Despite claims to be a plural forum for debate, the Summit was populated by ‘experts’ speaking the same language and all regarding the Internet as a tool for development in extremely mundane ways. Yet, as Burrell notes, “the relevant international organisations tasked with bringing about development …have far less of a handle on the efficacy and relevance of the Internet in places like Accra, Ghana, than the understanding young Internet café users have developed for themselves” (p157). The final empirical chapter tackles the ‘digital divide’ from an unconventional standpoint; namely, how PCs circulate. The author notes how machines in Accra cafés possess tags that identify them as once property of schools, businesses and government offices in the US and Europe. She then traces how PCs get to Ghana through diasporic networks, sometimes legitimated as ‘development NGOs’, or as e-waste that may be retrieved from the Agbogbloshie dump site. In ‘following the thing’ the chapter suggests that far from being devoid of IT hardware, Accra is awash with it. What is fascinating is how the material objects become reimagined as valuable or trash in the new space. Reliable, fast, machines become localised as “home-used”, a positive sign, whereas consumers claim some machines are just aburokyrie bola (foreign trash). The obvious materiality of the old PCs dumped on carts across the city almost seems a Coda to the disjointed, problematic, ways that young Ghanaians engage with the world online, both are mediated by the social world. Rather than a seamless narrative of upliftment, connectivity and promise, Invisible Users gives us a chance to think about lives being constructed in bytes and bits. Gareth A. Jones is Reader in Urban Geography in the Department of Geography and Environment at the LSE. Gareth’s research interests are in urban geography, with a particular interest in how people make use of the city, how cities are represented by policy and practice. He has conducted research in Mexico, Colombia, Ecuador, Brazil, India, Ghana and South Africa. He is editor or author of a number of books, most recently Youth Violence in Latin America: Gangs and juvenile justice in perspective (edited with D. Rodgers, Macmillan-Palgrave, New York). He is presently completing a joint book entitled Bringing Youth into Development (Zed) and has an advance contract with Temple University Press for a book tentatively entitled Street Corners in a Global World: everyday life and identities of Mexican street youth. Read reviews Gareth.